The world's first mini GPS locator, Buddi, is just the size of a matchbox but can help make sure that your kids are safe and sound. Buddi can pinpoint the wearer to within three metres anywhere in Britain within seconds. Anyone registered with an account for the device on the Buddi website can view the location on a detailed street map. A 24-hour call centre is also on hand. The person - whether it's a child, an elderly person or someone otherwise vulnerable - can use the Buddi device to alert friends or relatives in an emergency situation by pressing the panic button. This sends an alert to the emergency call centre, which informs parents, carers or friends, as well as local authorities and the police, if necessary. 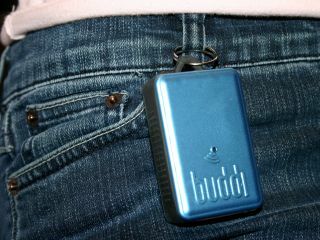 The Buddi device can be pinned to a pocket or belt, or hidden in a bag. Families are set to use the buddi device as an everyday service to keep their loved ones safe. "We live in difficult times," said Buddi's creator, Sara Murray. "Any service that can provide people with the confidence that they can be traced within seconds, or alert people in the case of an emergency, is something that I am sure will be seen as a benefit." The buddi service costs £20 per month, plus an initial £299 for the unit, which is available in black, silver, and blue. On the face of it, the Buddi seems like a great idea. But it'll only be as good as the person who's wearing it. The UK's more feral child population are more likely to lose or deliberately remove the device. They may even attach it to someone else.